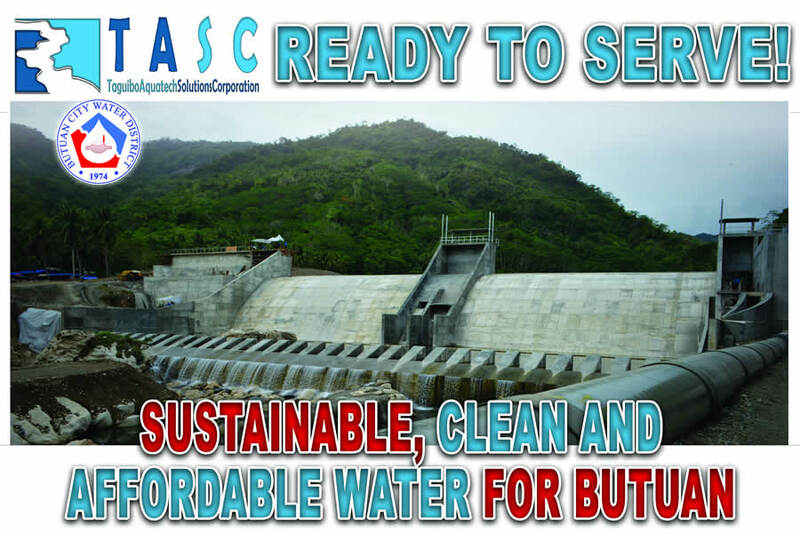 After so many obstacles, causing so much delay in its completion, the Taguibo Water Supply Development and Water Treatment Facility Service Project (TWSDWTFSP), a Public-Private Partnership (PPP) project between the Butuan City Water District (BCWD) and Taguibo Aquatech Solutions Corporation (TASC) is now ready to serve sustainable, clean and affordable water. Also known as the PPP Treated Bulk Water Project, TWSDWTFSP includes a Sabo Dam, considered to be the first line of defense to protect from the rolling debris and boulders. This does not hold water but it allows water to freely flow to the catchment area called the Impounding Weir which can hold an estimated volume of water that can sustain a supply for one (1) month. The river continues to flow; hence, we can assure to have a continuous water supply. The project package also includes state-of-the-art Water Treatment Plant that is both cost-effective and efficient. It can even filter up to 1,000 NTU because it has two-stage filtration process. This is a high-end advanced technology invention because it has two reactors, the coagulation and flocculation reactors, housed in a structure with two chambers – the coagulation and flocculation chamber and sedimentation chamber. Once the pipeline from the two chambers will be connected to the BCWD’s main transmission line in Iyao, the entire service area of BCWD will enjoy water supply anytime of the day even during rainy days. The project is expected to finally solve the perennial problem of water interruptions during rainy weather at the Taguibo Watershed.